If you have been following FOR’s education department for the last few years, then you have heard about our Meaningful Watershed Educational Experience (MWEE) program. A MWEE is a year-long program where students study an issue related to human impacts on watersheds and take action to help remedy the problem. Per the Chesapeake Bay Agreement, students in Virginia are supposed to participate in a MWEE three times during their schooling — once in elementary, middle and highschool. Obviously, MWEEs align perfectly with the mission of FOR, so we try to lead and support these programs whenever we can! For the last two years this has included leading professional development for Spotsylvania 4th grade teachers. These workshops focus on student action projects, content knowledge about the River and Bay and also activities teachers can take back to the classroom. 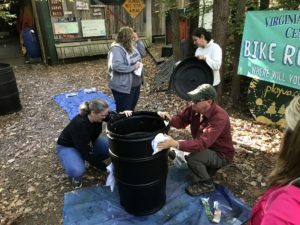 Just like last year, during this year’s training we prepped two rain barrels to be painted with students as part of their action project. Two lucky teachers got to take those barrels back to their schools where they will either be installed to catch water for school gardens or used as an educational piece for the school community.